ABS-CBN Christmas Special 2014 will be aired on TV this coming weekends, December 13 and 14. But the taping of which will be done tomorrow, Dec. 9. And I think for the first time, this annual gathering of ABS-CBN stars won't be held in a large venue and fans will not to be able to watch it live. Why?!? 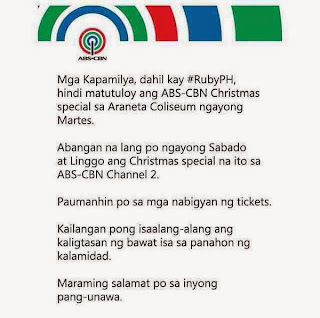 'Ruby' which might continue to rain heavy in Metro Manila until tomorrow, ABS-CBN has decided to cancel the event in the said venue, even if they have already distributed tickets to many groups of fans who were planning to watch live and cheer for their fave stars. 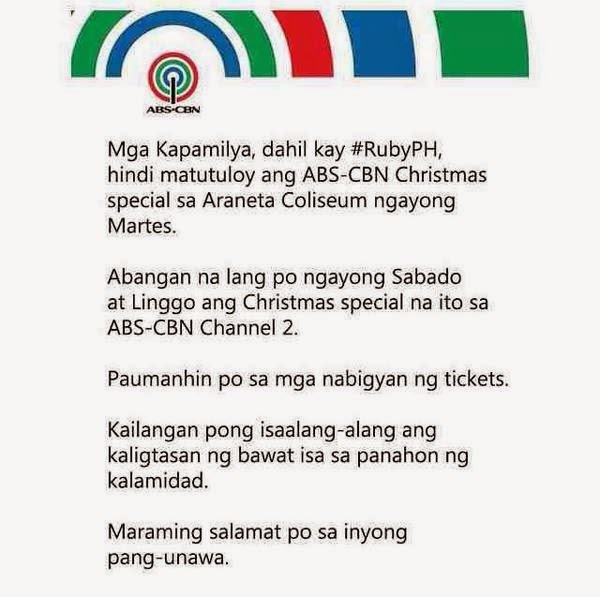 In the statement that the network released earlier today, ABS-CBN stated that for everyone's safety, the Christmas special isn't pushing through at the Big Dome tomorrow. It's just right, since PAGASA is still predicting bad weather tomorrow in some areas, including Metro Manila.